>I love mid 30s sportswear styles! I also really love the collegiate influence and the rage for college wear. So fun and sporty and wearable! Here’s some shoes from 1936 I wish I could just pick up and wear. Very fun, very sporty and still chic! These shoes would cost about $102 in today’s money according to the inflation calculator. I’m particularly in love with the Berkshire and the Cobbie Shawl… and I think I have a pair suspiciously close to the Hampton in my closet already! What are your favorites? Just a little reminder that I’m not going to be available to ship next week, so if you’ve got your eye on something in the shop snag it now ;) I just put up two lovely 1930s patterns from my personal stash! Hope you’re having a great week! Is it Thursday already? Where has the week gone? >Ohhh..the hampton and the delmay are my favorites! 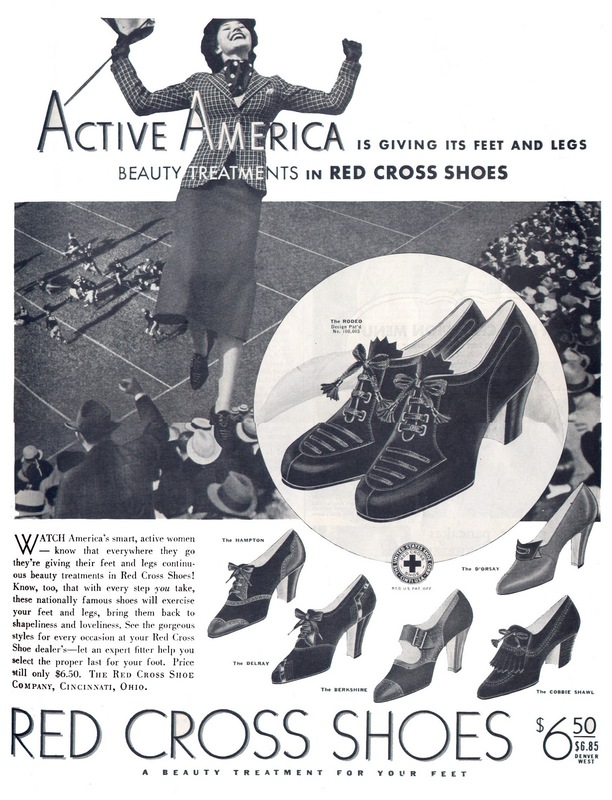 I am really dying to try some vintage 30's shoes. I am allergic to the chemicals used to tan leather (specifically chromium) which they didn't start using until the late 30's/early 40's and sometimes mid 40's….so I'm thinking it may be a great way for me to actually wear some real leather! >Super cute! I love the hampton in particular. That style is pretty in right now, but with stilettos instead of sensible heals! Wish I could find a reasonably priced pair I could walk in. >Well, what a coincidence! I just found out that Remix Shoes has recently released a bunch of new styles that look a lot like these… funny how everyone is looking at 1930's shoes today!Here's the link: http://remixvintageshoes.com/newstyles.html I think the "Myrna", the "Zurich" and the "Beverly" would fit the bill, don't you? >droolsville! I've got the Remix shoes mentioned by Nancy on my holiday list for SURE. Wish I could have all originals, though!!! >So funny you mention that, Garofit! I saw their beautiful shoes in person when I was there last year. That store is AMAZING, and the shoes were so well done.